What a clever way to destroy the career of a Palestinian activist. He founded an international movement, BDS, so arresting him for espionage or on a political pretext would bring the wrath of the world down upon Israel. So you look for an alternative and rip a page from the early FBI, which couldn’t topple Al Capone by conventional means. So it chose an alternative: taxes. Peter Brooks’ famous 1960s play, anticipated modern-day Israel? To add some context and motivation for this witch hunt: at an anti-BDS conference held earlier this year in Israel, ministers fell all over themselves to promise what they would do to destroy the international non-violent movement. One even called for the “civil” targeted assassination of the group and its leaders. This certainly put a target on Barghouti’s back, who was mentioned explicitly as someone the government would target, if not destroy. The allegations against Barghouti are that he earned $700,000 from a Palestinian company that owned and serviced ATMs, for which he was a director. As an Israeli resident, he theoretically should’ve paid taxes on these earnings. Instead, so the claim goes, he spirited the money in Palestinian and U.S. banks and never declared the income. The idea of imprisoning Barghouti for the alleged failure to pay taxes has a nice ring to it for the Israeli government. Since the BDS leader wants to boycott us, let’s get him where it hurts. Let’s make him pay the state he hates or go to jail. To an Israeli super-nationalist it’s almost divine justice. Since I am not an Israeli tax attorney I can’t argue about or against the charges. But I can note how absolutely hypocritical they are. Every wealthy Israeli, and I mean virtually every one, has a tax avoidance strategy. Some have offshore accounts on the Isle of Jersey. Others went to Fonseca to have trusts created on their behalf as confirmed in the Panama Papers. This includes many Israeli politicians (including Bibi himself) and virtually all of the eighteen oligarch families who own 60% of the nation’s capital. Nor do they squirrel away a few hundred thousands dollars as Barghouti allegedly did. They hide millions, tens of millions in income from Israeli tax authorities. You almost never hear of any powerful Israelis arrested or charged for such offenses. Periodically you’ll hear about some poor shlub who got nabbed for tax evasion. But he didn’t share a family name with any of the Israeli élite families. Isn’t it curious that none of the Israeli reporting on this story mentions the offenses of virtually an entire class of wealthy Israeli Jewish individuals who get away with murder? Not to mention that Barghouti, who remains under arrest, is being treated like a terror suspect. The international model, Bar Rafaeli, faced even worse charges of deliberately hiding millions of dollars in income. She was arrested and questioned, but never imprisoned. Israeli authorities seems to be persecuting Barghouti in the same fashion they harassed Azmi Bishara. They charged him with money laundering on behalf of Israeli enemies like Hezbollah. But the Shabak never forbade him from leaving Israel, which is precisely what he did. Yet another in a long line of forced expulsions (or involuntary exile) of “dangerous” Palestinian leaders who threaten the prerogatives of the State. This banana republic is resorting to the tactics of the former Soviet regime and the current Chinese regime. Got a guy who’s a thorn in your side? Does he promise to embarrass you on the world stage? Trump up some charge, take away his passport, even arrest him so he can’t accept that Nobel Prize. In Barghouti’s case, a 65 year-old NGO, Promoting Enduring Peace. plans to bestow on him the Gandhi International Peace Award next month at Yale University. Past recipients of the prize have included Eleanor Roosevelt, Rabbi Maurice Eisendrath, Martin Luther King Jr., George McGovern, Dorothy Day, Daniel Ellsberg, Rabbi Arik Ascherman, and Medea Benjamin. The Israeli police have conveniently confiscated his passport so he can’t accept it. If they forbid him from traveling there, we must all do our best to ensure that the award ceremony is as widely known as possible inside and outside Israel. Globes, the Israeli business publication whose story I linked above, has made one major mistake in its coverage. The Gandhi Award has nothing to do with the government of India, as the reporter states. There is a separate prize in Indira Gandhi’s name which is completely independent of the U.S.-based Gandhi Award. Also, the award is not given by Yale University, but by a New Haven-based NGO at a ceremony held at Yale University. In a related development, Anti-BDS minister (yes, there is such a thing) Gilad Erdan, told the security cabinet he intended to begin compiling a database of Israeli supporters of BDS. The dossiers would include all relevant personal information available on these dangerous, seditious figures. I might add, that the targets would likely include individuals I hold in highest esteem. There was a wee, small problem: the attorney general thought it was a terrible idea. He said there is no statutory authority for a civilian ministry to spy on or maintain files on Israeli citizens. Besides, he said the Shabak was already tasked with such a mission. You can be sure that most of the Israeli activists you’ve read about here on in other progressive publications have their own personal Shabak files. Why do you need overkill with a second agency monitoring the same people? Why does any democratic nation (or at least one calling itself one) need to assign secret police to compile dossiers and spy on citizens supporting social justice and non-violent change? Further, the U.S.-based Israel Studies Association, which itself was an academic discipline largely funded by wealthy pro-Israel donors seeking to present Israel in a flattering light in the classroom, protested to the Israeli government that it can no longer hold any meetings in Israel. It seems that some of its member support what I call BDS Lite, a boycott of settlement products. Even these liberal Zionists might be deported from the Jewish homeland for the crime of supporting BDS. Can you imagine an association of French or German studies professors whose work would be criminalized in the countries they studied, so they could never visit the places on which their entire professional lives are based? For those of you old enough to remember, my post title is inspired by Peter Brook’s famous 1960s play: Marat/Sade. H/t to Ofer Neiman. Tax evasion in Israel, among cash businesses, is rampant, and Israel’s tax collectors are particularly odious. There was a story in Israel not so long ago about a street vendor who’s pita sales were targeted by tax collectors. If it’s $100000, it tax evasion. If it’s $100000000, it’s tax avoidance. Because his wife is a Palestinian citizen of Israel ! This was of course before the fascist State prevented Palestinian citizens from bringing their spouses. And Barghouti is a Palestinian, being born elsewhere does not make him less Palestinian, and as such he has much more right to live on this land than the average American or French olim ! It’s easy to theorise about this case form our own personal bias but this really is a case of “plausible deniability” — much like when something happens to a famous person, where a plethora of conspiracy theories arise (usually not paying any attention to the Occam Razor simplest part of the equation). Omar indeed may have been “stitched up” or he also may have done what he is accused of, I’d say the truth lies someone in-between. He studied in Tel Aviv university as an Israeli, let’s not forget that. @ Jim: thanks for the tired anti BDS hasbara meme. Neve Gordon teaches at Ben Gurion University. Does it make him a hypocrite for supporting BDS? No. It makes him a principled academic standing up for moral/ political values. Same for Barghouti. Let’s see – his family emigrated from their ancestral village when under Jordanian rule, they weren’t expelled and weren’t refugees. He married in the US, and moved to Israel where he proceeded to go to university and actively work to destroy the nation state of the Jewish people, whom he doesn’t recognize to be a “people” at all. So, a fraud, a liar, a hypocrite, a Judenhasser and a tax evader all rolled into one – exactly the kind of person that should be given special approval to “reunite” with his wife’s family? Not. As an Israeli, what are you talking about ? He’s a resident, contrary to Jews who settle down in the State of Israel who gets the Israeli citizenship immediately, Barghouthi isn’t an Israeli. And if you google, you’ll see that Omar Barghouthi enrolled at TAU many years ago, long before the BDS movement started, and apparently he didn’t even start his studies. Horseshit. He doesn’t want to destroy your state. He wants to turn it into a fully democratic state with equal rights for all citizens regardless of religion. That threatens you as it should if you’re a Jewish supremacist. As for those words “fraud,” “liar” & “hater” they describe you to a T.
You’ve been automatically accorded moderation status due to your outburst of hate. @ Stan: Liar liar pants on fire. He’s Palestinian. Only hasbaroids & Israeli media or ignorant foreign media would omit that. That would be a little like saying I’m not Jewish because I live outside Israel. Just because he says he’s Palestinian doesn’t make him one. Just as you living outside of Israel and having never been naturalized makes you not Israeli. Is “Palestinian” now a religion or “race” that one can wear just by saying so? Is one a “Palestinian” forever because one’s parents once lived here (at least according to UNWRA’s ridiculous definition, yes). His parents lived here – they left. He never came here before 1993 – after having lived in Qatar, Egypt and the US. Your head is full of said equine excrement. @ Stanley: The error originated in the Globes piece which said the award was being given by Yale. I noticed it when I looked at the website (which is linked in my post), but neglected to fix it. Thanks for the correction. Umm, yes it does. He’s the one who determines his ethnicity & nationality. Not a hasbarist like yourself. Unfortunately, for you there are a few problems with this analogy. “Israeli” is a recognized nation with passports and citizenship. Thanks to Israeli rejectionism there is no formal Palestinian nation. If there was Barghouti would have a Palestinian passport since his parents were Palestinian. Umm, yes in fact that’s how citizenship works. If you’re born in a country you are a citizen of it. And your children can become citizens too (in most countries) by virtue of your own citizenship. Since you’ve offered no source for these quotes (something I demand per the comment rules) I can’t credit any of this as accurate. Find the source for the quotation & offer it here. Personally, I would disagree. Jews are a people. But they are not a nation, which is what Barghouti should’ve said. Israel was a colony until 1948, so under his defintion Israel and its inhabitants have a right to self-determination. But Jews abroad do not have the same right unless they make aliyah which, in my opinion should face restrictions as I’ve noted here in the past. I don’t trust truncated quotations. Don’t offer them. BUt if your quotation is accurate (& I have no reason to believe it is), he misconstrues bi-nationalism. Binationalism construes 2 nations living in the same country. The system of governance within that single country is not fully defined. If Barghouti assumes the two nations would govern themselves independently within the country then I can understand his point. But that’s not necessarily how it’s construed. There can be autonomy offered to the two nations on a local basis, while they govern themselves nationally within a single system. Major comment rule violation. You are now banned. Well, the Jewish studies folks are not fearing trouble from Israel because their WORK HAS BEEN CRIMINALIZED but because of their POLITICS. But all power to them! RE: “For those of you old enough to remember, my post title is inspired by Peter Brook’s famous 1960s play: Marat/Sade.” ~ R.S. MY COMMENT: And quite a play it was. 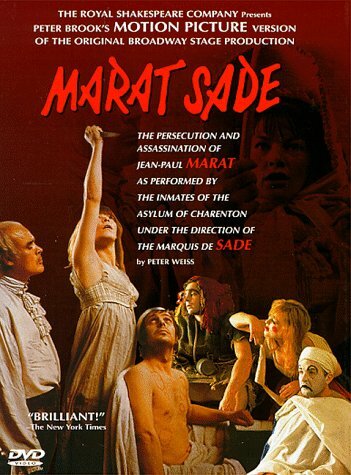 Nicely turned into a film* in 1967 with Patrick Magee as the Marquis de Sade and Ian Richardson as an inmate playing Marat.The nefarious deed (i.e., stabbing Marat while he was soaking in a medicinal bath for treatment of severe skin problems) is accomplished by Glenda Jackson playing an inmate assigned the part of Charlotte Corday [who, I suspect, may have had a bit of a Joan of Arc Complex].